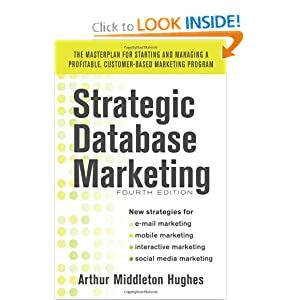 Many companies, today, including banks, are investing heavily in database marketing. In most cases, several million dollars are required for design, software, and database construction. Some banks are finding, however, that the early paybacks are not as high as expected. What is the problem? Collect relevant and accurate data about their customers. This means the construction of a comprehensive Marketing Customer Information File (MCIF). Develop an accurate and credible system for determining the profitability of each customer, on a periodic basis, preferably at least monthly, using day to day inputs on interest rates and costs. Develop segmentation schemes that divide customers into useful and actionable segments based on profitability. Develop and implement tactics, based on these segments, which are used to modify the behavior of employees and customers to increase sales, improve retention, lower costs and improve profits. If companies execute successfully all four steps, the payoff can be quite significant. This article discusses how to go about carrying out these four steps. It is based on actual experience of the authors with several companies which have gone about this process. Collecting customer data: Includes gathering relevant and accurate data about prospects and customers; storing and updating it in a database; making it available to marketers and other company staff in a form useful for database marketing. Few financial services companies, including banks, have gotten beyond this phase. Most of them feel they are successful if they have built a customer marketing database and conduct a few surveys of customers. Turning data into knowledge: Requires developing methods for data analysis so that the data collected can be understood and converted into knowledge and actions. This process involves developing appropriate customer and prospect segmentation schemes, modeling, scoring, and profiling. It involves conducting tests and setting up control groups. Many companies have experimented with solutions to this problem, but most of those have not yet even solved the collection problem. Developing strategies and tactics to modify behavior: Involves using the knowledge gained from solving the first two problems to modify the behavior of employees, customers and prospects so as to improve the long term profits of the institution. This step may include such tactics as reallocation of resources, communications, dialog, loyalty programs, customer specific pricing, frequent buyer programs, special services, recognition, performance measurement and incentives. All companies have experimented with various aspects of behavior modification, but most have tried it without first solving the first three basic problems. Monthly Profitability Determination. Capture all customer data on all product accounts in a single MCIF that determines – on a monthly basis – the profitability of every product owned by every customer of the bank. Customer Profitability Segmentation. These product profitabilities are rolled up into a customer scoring and segmentation system that ranks all bank retail and commercial households into one of five profitability segments. These segment designations are recalculated monthly, and made available to the marketing staff and all bank personnel who have customer contact. Behavior Modification. The segment designations drive an active behavior modification program including cross selling, up selling, resource allocation, retention building, referral generating, product pricing, and programs of recognition and provision of special services. To understand the process, assume that the above chart is typical of a bank’s customer profitability segments. This chart shows how the typical bank’s customers break down into five profitability groups, based on monthly profit contribution. The numbers are based on pretax profits, calculated using methods explained later. The five groups are not of equal size. The top group consist only 5% of the households and contributes 80% of monthly profit. The second group represents 11% of the households and contributes 25% of monthly profit. Together, 16% of customers produce 105% of profit.Group five, representing 28% of customer households, erodes profit by 22%. This is amazing and insightful information. Many banks suspect that their bottom quintile is costly to them. Few have the information to prove it. Cost of Funds. Banks obtain money from depositors and loan it out to borrowers. They make money on the difference in what they pay depositors and what they earn from borrowers. The Cost of Funds is the amount of interest expense paid for the funds used. Funding Credit. The amount earned by the bank on the deposits employed. Margin. The difference between the interest earned and the interest expense. Loan Loss Provision. All loans have risk, and some loans never get repaid. The Loan Loss Provision is a pool of dollars reserved by banks to cover expected loan losses. Capital Allocation. Capital is the equity of the company; the difference between assets and liabilities. Capital allocation is the amount of capital set aside for each product to cover unexpected losses and is based on the overall risk profile of the product. Capital Charge. The capital allocated multiplied by the bank’s desired rate of return on the capital assigned to the product. Overhead. The fixed and variable expense associated with the product. These include origination expense, transaction expense, maintenance, and personnel expense. FDIC Expense. The cost of providing deposit insurance through the Federal Deposit Insurance Corporation. In this case, the gross monthly profit of $11.74 from the average balance of $1,184 was overwhelmed by the high overhead costs of $15.17. This customer visited the branch several times a month to make deposits or cash checks. At $1.65 expense per visit, his branch visits wiped out the profitability of this particular product. * Note that the capital allocation for a checking account is significantly less than for a loan. This is reflective of the higher risk of loss from loans vs. deposit accounts. Every customer in the bank, therefore, can be classified as either a 5, 4, 3, 2, or 1, where 5 represents most profitable customer, and 1 represents the least profitable customers. Once each customer is segmented by profitability, it is possible to study the behavior of certain segments. In this example, customers are ranked by number of products owned. Each bar represents 2% of a bank’s retail customers, ranked by profitability. It is interesting that the most profitable and least profitable share some of the same characteristics: they both use many of the bank’s products. This behavior is even more pronounced when the visits to the bank’s branches are compared in Chart 5. The heaviest branch users tend to be the most and least profitable customers. Many of the others rarely visit a branch office. Armed with the database knowledge, skilled statistical analysts are able to build models to predict such things as: the profit propensity of customers; which products a customer is next most likely to need; and which behavior change will improve the customer’s profitability. This information can be made actionable by using a technology solution to deliver the knowledge to the bank’s customer contact personnel at the very point of contact (teller line, service desk, or platform). Customer contact personnel can then utilize the knowledge to improve cross-sell and up-sell opportunities, to make better decisions regarding pricing and fee waivers, and to suggest alternative channels for certain types of transactions. Since the profit segment 5s and 4s represent only 16% of the customer households, but up to 105% of the monthly profit, the bank will want to allocate substantial human and marketing resources toward retaining these customers. And, since human resources are limited, particularly those resources devoted to sales, the bank should attempt to direct the acquisition activities of their calling officers to prospects who have the potential to be profit segment 5s or 4s. In addition, the bank desires to expand the relationship of all customers by selling additional products and, thereby, improving the household profit. Finally, as to the lower profit segments, actions should be taken to reprice unprofitable products such as certificates of deposit and loans as they mature or are renewed. Employees should refrain from reducing or waiving service charges and fees, and concerted efforts should be used to migrate these customers routine transactions to less expensive alternative channels of delivery, such as ATMs, and call centers. Only a few financial institutions have achieved the level of customer knowledge and resulting behavior modification programs that we have outlined here. The entire process begins with a relatively complex monthly profitability calculation for each product for each customer. This is hard work, with a lot of time, effort and imagination going into the creation of the appropriate algorithms. Once profitability is calculated, the next step is crucial: grouping the bank’s customers into a manageable number (such as five) of profitability segments based on these monthly ratings. The final step is the most important. It includes using the knowledge created to develop appropriate strategies and tactics for improving profitability and customer service. This includes tactics to modify the behavior of employees, customers and prospects. The entire system drives the bank’s resource allocation, expansion plans, relationship and retention building programs, and even their telephone call answering systems. Those banks that have such systems in place have taken a giant step forward that will take their competitors years of very hard work to equal. Robert James is Group Manager at the Centura Bank. Bob has twenty four years of service with the bank and it’s predecessors. He is a graduate of the University of North Carolina at Chapel Hill, and the LSU Graduate School of Banking. He can be reached at (919) 977-8233 Fax (919) 977-6362.